Strip Search: How Safe are Airports' New X-ray Scanners? How safe are airports' new low-radiation scanners? A photo illustration simulates new scanner technology. In a real-life situation, security officials are in a separate room from passengers. Don't be surprised if on your next trip to the airport, security personnel tell you to stop and put your arms up. No, you're not being arrested. You're being X-rayed from head to toe--or, more accurately, from toe to head. The latest generation of airport scanners is designed to detect nonmetal weapons such as ceramic knives and explosive devices that can slip past magnetometers. The new machines--135 of them are already in operation, and nearly 1,000 are expected to be in place by the end of 2011--rely on low-intensity radiation that is absorbed a few millimeters into your skin and then reflected back, creating a reasonably accurate contour image of your body and anything else underneath your clothes. 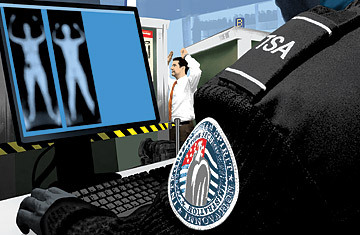 When the Transportation Security Administration (TSA) began rolling out the so-called backscatter machines in March, the agency, along with the Food and Drug Administration (FDA) and the National Institute of Standards and Technology, assured the public that the radiation dose from a scan was negligible--far lower not only than the amount in a chest X-ray but also than the levels passengers absorb from cosmic rays on a cross-country flight. The backscatter numbers, however, seemed too good to be true to several scientists, including John Sedat, a biophysics professor at the University of California, San Francisco. After studying the degree of detail obtained in the seconds-long scans, the scientists wondered how the radiation exposure could be so low. The answer, they concluded, lay in how the manufacturer and government officials measured the dose: by averaging the exposure from the beam over the volume of the entire body. This is how scientists measure exposure from medical X-rays, which are designed to zap straight through bone and tissue. But backscatter beams skim the body's surface. Sedat and his colleagues maintain that if the dose were based only on skin exposure, the result would be 10 to 20 times the manufacturer's calculations. That's a huge difference, but the higher amount, TSA and FDA officials maintain, still falls within the limits of safe radiation exposure. Based on measurements conducted by the FDA as well as by technicians at Johns Hopkins University and elsewhere, says the FDA's Daniel Kassiday, "We are confident that full-body-X-ray security products and practices do not pose a significant risk to the public health." Scientists concerned about backscatter technology agree that the health risk to individuals is low. But the probability that a population would see more malignancies as a result of the scanners goes up the more people are exposed to them. Each year, an estimated 800 million people pass through airport security checkpoints around the world. "Never before has the radiation community had to deal with a situation like this in terms of the number of people exposed," says David Brenner, director of Columbia University's Center for Radiological Research, who evaluated the safety of the scanners nearly a decade ago and thought they would be safe for screening a limited number of passengers. That will no longer be the case, he says, if the scanners are used on nearly everyone. Widespread use of the technology is especially worrisome to critics given the number of children who fly. Their skin is more vulnerable to the damage that radiation is capable of causing to DNA, which can transform a normal cell into a cancerous one. Similar concerns apply to those with genetic mutations that predispose them to breast cancer, since the affected tissue lies close to the surface of the skin. Sedat is urging the National Academy of Sciences, a government advisory board of scientific experts, to take its own measurements of the machines' radiation output. In the meantime, there are other options. New millimeter-wave scanners use non-radiation-length electromagnetism to produce similar images. And passengers can opt for a physical pat-down. But they have to know to request one. And at least some TSA workers don't seem terribly well informed yet. On a recent trip, Brenner was directed to what he knew was a millimeter-wave device. Yet when he asked a TSA employee whether it was an X-ray scanner, she said, "Yes, but don't worry about it." This article originally appeared in the October 4, 2010 issue of Time magazine.